Twitter, the micro-blogging platform we all love to hate, has made a number of updates to the way you search for content and discover new things overnight, that you may or may not even notice. 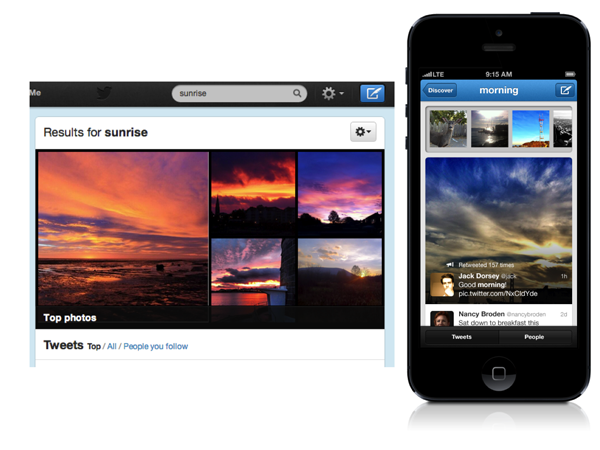 One of the main updates has been to the way you search Twitter. Type something into the search bar and you’ll now be served much better results to highlight photos, videos and news that have all been shared online. You’ll also now see a grid of relevant media above the tweets, which you can see in the photo above. Interestingly, Twitter wants you to have a better understanding of why certain tweets rank higher than others too, so if you get served a tweet you’ll see more context about who favourited it or retweeted it. There’s also now a new way to share tweets directly from the Twitter.com website. You can email a tweet to anyone whether they use Twitter or not right from your stream, which could be an interesting way of getting more people involved in the social network. Or just prove to be really REALLY annoying for those who like to avoid everything social media.